Ten retired defence officers on Monday formally joined Dr Kamal Hossain-led Gano Forum ahead of the 11th parliamentary elections. They joined Gano Forum, a key component of one of BNP’s alliances Jatiya Oikya Front, at a programme at Dr Kamal Hossain’s Motijheel chamber in the afternoon. The defence officers include Lt Col (retd) and freedom fighter Khandakar Faridul Akbar, Lt Col (retd) Sheikh Akarm Ali, Lt Col (retd) Mohammad Shahidullah, Lt Col (retd) AFM Nuruddin, Maj (retd) Masudul Hasan, Maj (retd) Md Imran, Maj (retd) Md Badrul Alam Siddiqui and Squadron Leader (retd) Md Forkan Alam Khan, Squadron Leader (retd) MD Habib Ullah and Squadron Leader (retd) MD Mahmud. However, Dr Kamal was not present at the programme due to his other engagement. Gano Forum executive president Advocate Subrata Chowdhury welcomed the ex-defence officers presenting them flowers. Chowdhury hoped that people will win the battle of ballot on December 30 as it is the last chance for bringing a change in the country’s politics. Senior Gano Forum leaders, including its presidium members Jaglul Haider Afrik, AHM Shafiq Ullah, Gono Forum training affairs secretary Rafiqul Islam Pathik and executive committee member Maj (retd) Amin Ahmed Afsari were, among others, present. 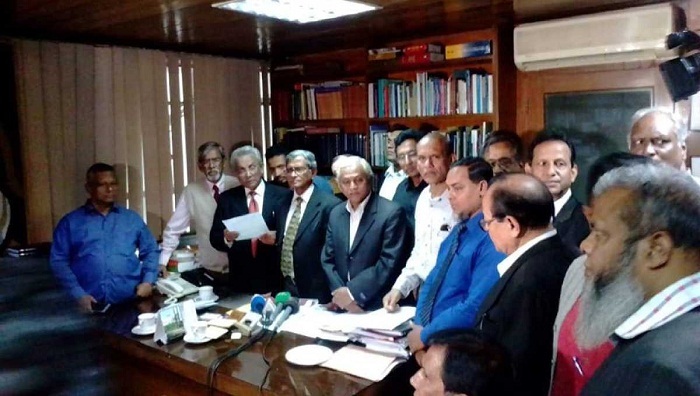 Earlier, Reza Kibria, son of slain former Awami League Finance Minister Shah AMS Kibria, joined the party and submitted its nomination paper to Dr Kamal on Sunday to contest the December 30 parliamentary polls under Jatiya Oikya Front from Habiganj-1 constituency.